Madrid (Spain) – April 10, 2018 (travelindex.com) – Considered by many the best football player of all times, Lionel Messi joins the World Tourism Organization to promote the value of responsible tourism. 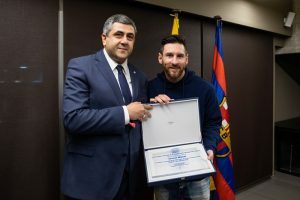 The UNWTO Secretary-General, Zurab Pololikashvili, appointed Messi as UNWTO Ambassador for Responsible Tourism this Saturday at Camp Nou in Barcelona, after the match F.C. Barcelona – Leganés. Messi is the first football player in history who won five Ballon D´Or – the first four won consecutively – and four European Golden Shoes.